Low Fat, Low Carb Soup for Weight Watchers! This recipe is for my beautiful sister-in-law Y. And to remind me of what I can eat and still feel good. I believe Nigella calls it “temple food”. This is a lovely warm treat for lunch, and a great deal better for you than Special K!! It’s also super-duper easy to make. 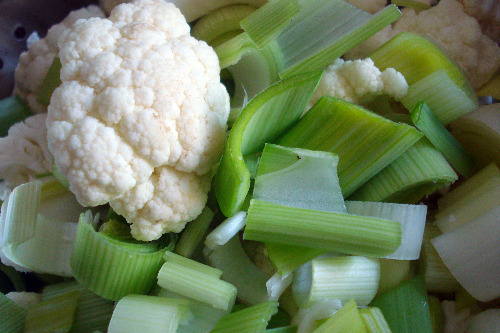 You need 1 head of cauliflower, 3 leeks and 3 cloves of garlic. Make 1 litre of vegetable stock (keep things easy and use Marigold Bouillion from Holland & Barratt). Trim, slice and wash your leeks. Put them in a large saucepan with 3 crushed cloves of garlic and a good splash of olive oil. Saute lightly for about 10 minutes with the lid on – keep stirring. After 10 mins the veg should be soft but not coloured. Add the stock, bring to the boil and simmer for 20 minutes. Then blend thoroughly. You’ll be left with the most delicious, creamy soup ever. Its warming and good for you – with little fat or carbs….